So Dan expertly analysed the Australia and New Zealand contenders and it has been left to me to try and cover off our international visitors. And quite frankly he got the easy gig, we all know how well Brendan and Beth and Vajin and Mick can run, but trying to figure out what sort of form our Northern Hemisphere colleagues are in is pretty darn hard. One consolation is that Francois D’haene from the Salomon Team stepped down to the relay today as he feels that this would suit him best for races later in the year. He will partner up with Emelie Forsberg in the 80km relay going head to head with Rickey Gates and Anna Frost. On paper many would not put is past being an American 1,2,3 ! Why do I say that, well, firstly it makes this post easier to write and secondly and more importantly the calibre of Sage Canaday, Jason Schlarb and Tim Olson make for one very interesting match race. Obviously add in the locals and we have one of the best show downs in many a year. Why do I think these 3 guys could run a way with it ? Well you only have to look at their pedigree’s. Let us start with Tim Olson. I am still shaking my head at what he achieved on the last Saturday in June 2012 when the Western State 100 course record was obliterated. Since then we have seen him professionalise his career by signing with the North Face, we have seen him become a doting father to son Tristan and we have seen him run injury free. Wrap this in an attitude of someone who genuinely cares about the sport, the environment in which he runs and the legacy he wants to leave and you have a pretty mean competitor. 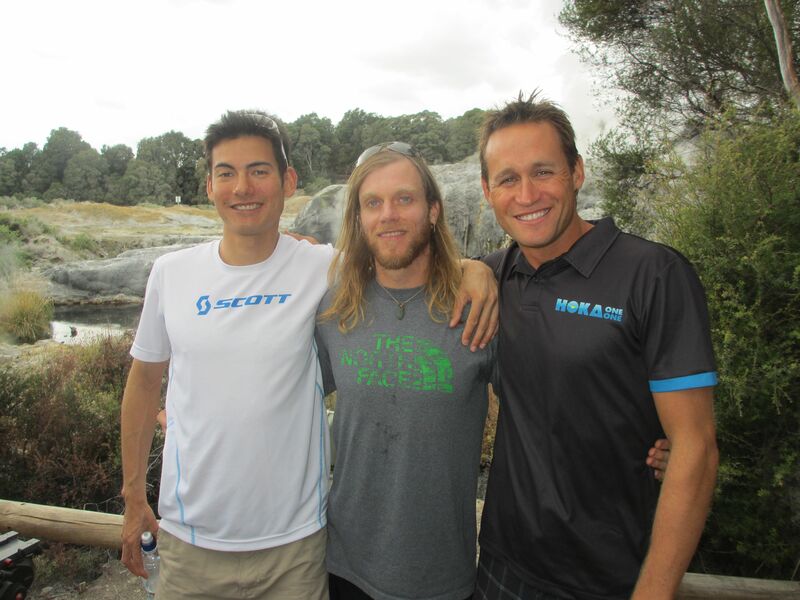 What can Tim do in this race , well he loves the hills, so will Tarawera have enough hills ? Compared to some of his big hundreds, no, but there is still enough punch in this course to challenge the best runners, so factor in Tim’s strength to keep him in the mix on the return leg. Coming off the back of a credible second at the Ray Miller 50 and with the knowledge that once Tim knew who he would be racing he has seriously upped his training to make this race count. If you dont know what Tim looks like, he will almost certainly be without a shirt for the majority of tomorrows race and being crewed by expert and wife Krista. Now we come to one of the younger runners in the race, Sage Canaday – his age defies his running years as he has been in this game for over 15 of them. Racing for the prestigious Cornell University Track Team exposed him at a young age on what it takes to become an Olympian. Couple this with big event experience such as the New York marathon and with his blistering speed his moves to trail ultras in the last 18 months has been closely watched. On paper he is the fastest man over 42.2kms (2:16) and if he can maintain this for another 60kms and we will have fireworks for sure. He has a reputation for being a fast starter and will take it out hard. Some athletes will sit back and watch, but trust me, if you let him get too far ahead then you will be running for minor placings. Chatting with Sage over the last few days, he is all about the business, the business of running, the business of the sport and its sponsors and with a recent signing to Swiss team Scott he is actively taking up the role of building their brand in the US and beyond. Sage has the foresight to know that to make it in this sport you have to be proefssional in everything you do and we have seen this on display with the way he engages with all his competitors and fans. Jason Schlarb is a marketers dream, the looks, the ability and the engaging persona that allows him to quietly go about his business in a successful way. A talented soccer player up to university before switching to running where he was very successful at track and cross country. He has almost become a bonafide Kiwi as he has been in the country for several months biking and running the odd race such as the Kepler challenge, where he snared a credible 4th place. Jason has the pace like Sage and the experience gained from fellow Hoka One One team mates such as Dave Mackey and Karl Meltzer. He will undoubtedly give this race a proper nudge and will be targeting a good result as he wants to take this form into the Leona Divide in order to gain a place at this years Western States. So we all wait with baited breath as to how the race will unfold tomorrow and we are sure to see more than a few of these athletes fire !